Free Slide Show Pilot Download from FilesPack.com! Slide Show Pilot enables you to make slide shows and screensavers simply by dragging and dropping images. Program's toolkit has over 30 transition effects and sound adding/synchronizing capabilities. 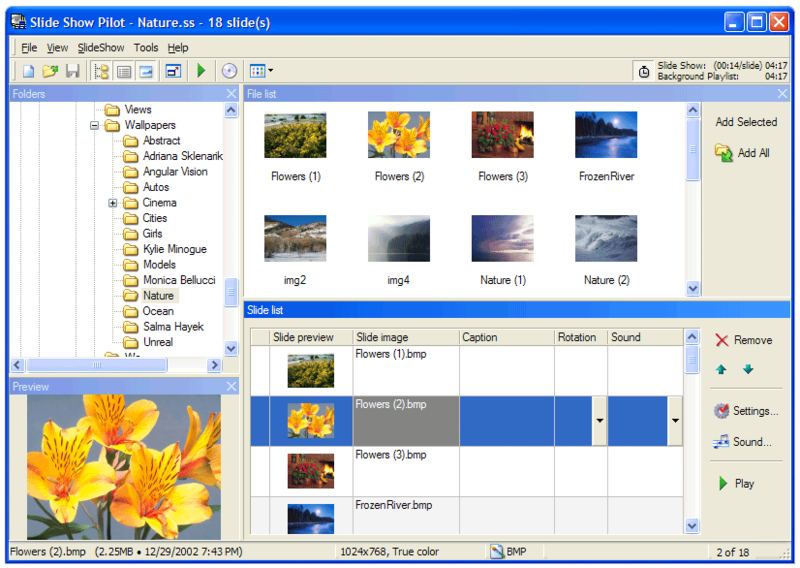 The program allows you to add captions for images, create web galleries and albums from several slide shows. You can save your slide show as a standalone executable (.exe) file for sharing or recording to CD. You can free download Slide Show Pilot 3.0 now. - Version3.0 always synchronizes slides with the Sync Playlist (the Sound button). Also there's the independent Background Playlist. By default, the Sound column of the Slide List's Details view with the slide-specific playlists is hidden. - You can insert silence intervals into playlists.